Project Life: Week 8 | I am JuJu! ← Something You Don’t Want To Hear On A Plane! It’s hard to believe that we are already 8 weeks into 2012. Time is flying by! 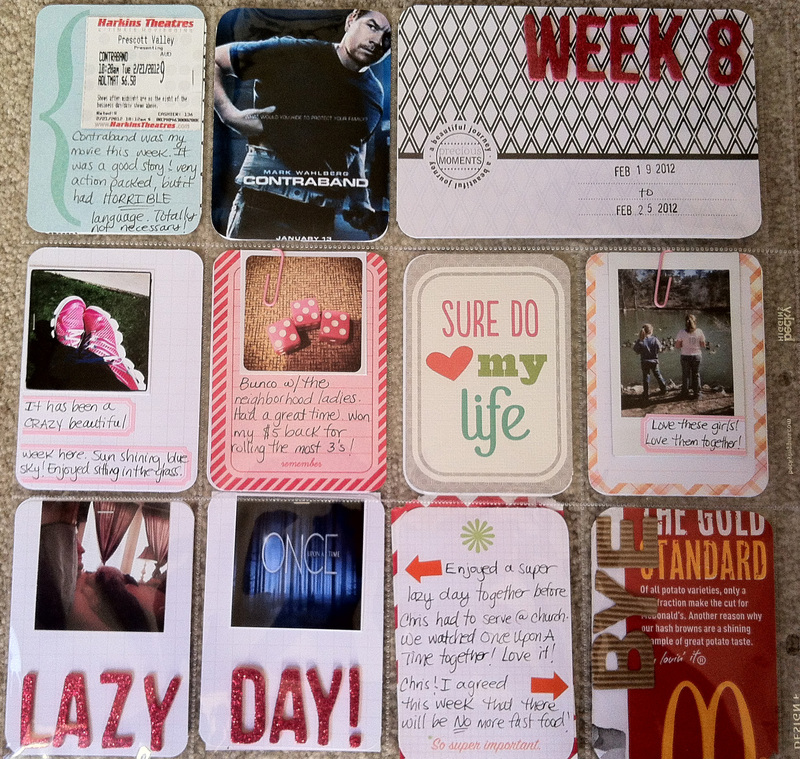 I am still LOVING documenting our everyday lives with Project Life. I kept things pretty simple this week. I love that with Project Life you can do as much or as little as you want. I have quite a few pictures & links to share with you so let’s get on with it! Below is a shot of the entire week’s spread. I used the back of Design F on the left and good ‘ol trusty Design A on the right. This week I used multiple Instagram pictures, a picture I snapped with my Instax Mini7S, a picture from my iPhone, as well as pictures using my big camera. Below is a close-up of the left page. I really love the design F page. I love having lots of smaller pockets to work with. I of course added a picture of my “movie of the week”, along with the ticket stub and a few of my thoughts. I continue to love using the Martha Stewart labels to add my journaling. 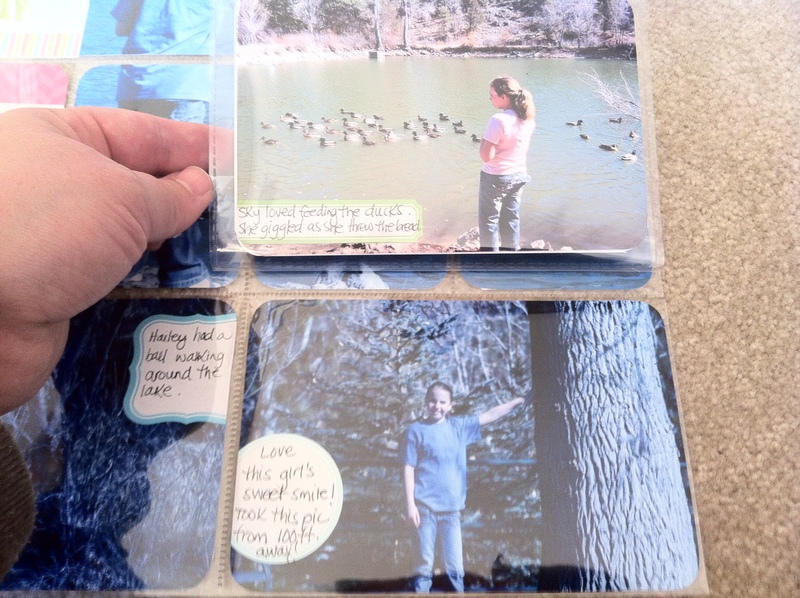 I also used paper clips to attach several of my photos to the journaling card. My sister uses paper clips quite a bit and I picked up a container of assorted colors at Staples this week. I love using everyday office supplies on my pages. The “Sure Do Love My Life” card is part of this set that was created by Kristina over at One Happy Mama and her friend Crystal. The set comes with so many cute downloads! I purchased the printable set, but she also has a digital set if you do PL digitally. I used several more on the right side of my page which is shown below. This is my favorite part of my pages this week (and Chris’ too)! I enlarged a picture I took of Hailey feeding the ducks at the pond behind our house. It was a gorgeous day so the girls & I walked down & spent some time hanging out by the pond. I enlarged the photo to 8.5×11 and then trimmed it down to about 8×9.25 to fit into the pockets. I had seen this done on Kelly Purkey’s pages here and knew that I had to try it. I will definitely be doing this again! Below is a close-up. The “Today Was A Great Day” and the “You Crack Me Up” cards are also from the set that I mentioned above. I knew that the picture I had of the girls making a “shocked” face standing next to the private property sign would be perfect attached to the “You Crack Me Up!” card. Below is a close-up of the bottom of the right page. I combined two pictures into a 4×6 using this tutorial by Ali Edwards that I’ve mentioned before. I also used another one of these flip up protectors to add a couple additional pictures. The picture below shows what is underneath. All three labels that were used to journal above come from the Martha Stewart collection found at Staples. I also plan on adding this post that I shared on my blog this week. It shows Skylar’s regression into autism in pictures. Because it is so picture heavy I am trying to figure out how to best include it. My thought is that it will take 2 of the 6×12 page protectors. In that post I shared how thankful I am that I have always taken lots of pictures. It’s not easy to see those pictures, but I am encouraged by the improvement we have seen over the past 10 years. I also wanted to share a photo of the cool vintage card catalog drawer that I scored from a fun antique place in Phoenix. As soon as I saw it I knew that I wanted to use it for my PL journal cards. Removing them from the wooden box in this post, allowed me to free up room in the box for longer items. I LOVE having all my journal cards in one place. I’m going to make a fun label for the front with my Silhouette Cameo. Oh wait…I don’t have one of those. Oh well…maybe for my birthday! This week I am linking up with both The Mom Creative and One Happy Mama. If you need more Project Life inspiration click on over there and see what everyone has done. I’m so thankful for the friends I have made there! This entry was tagged project life, project life organization. Bookmark the permalink. Back to the pages. I love the dice for Bunko. Great shot and way to capture that memory. Lovely, lovely pages! Thank you Cami! Something just clicked in us this week & we both agreed that fast food is slowly killing us. Feel better already! Thanks for stopping by & for your continued encouragement! Wow! How much do I love how you’ve used that design F?! That photo split over the pockets looks amazing! I saw KP’s pages like that and put it down as a ‘will do someday’ – you’ve definitely reinforced that notion. Love those cards from Kristina and Crystal – super cute. 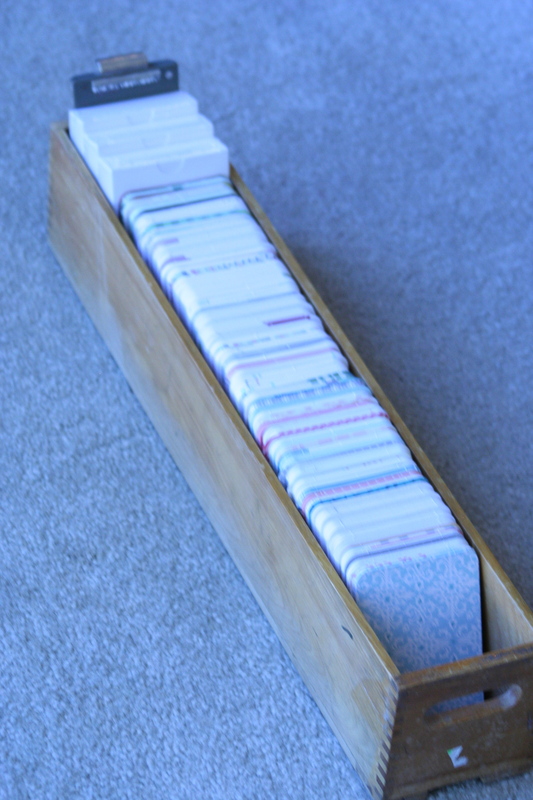 And that box for yout journal cards made my little scrappy organised heart beat very fast – brilliant idea! Thanks Jules! I absolutely LOVE design F! 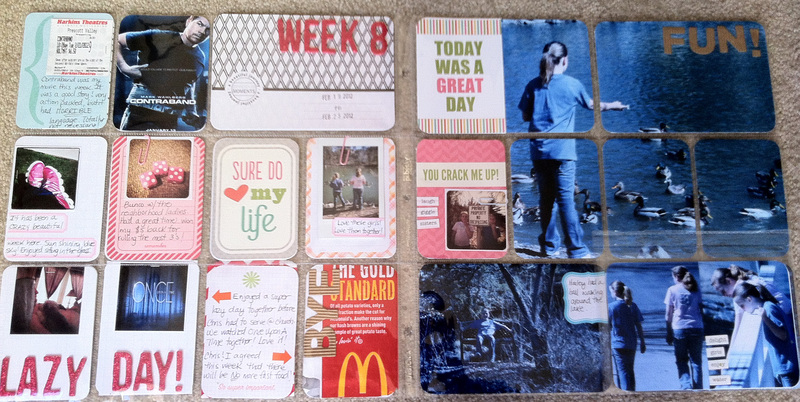 All the cards in Kristina & Crystal’s set are awesome…can’t wait to use more of them! Thanks so much for all of your encouragement! Have a great week! So cool Julie. There is something in every picture that I love! 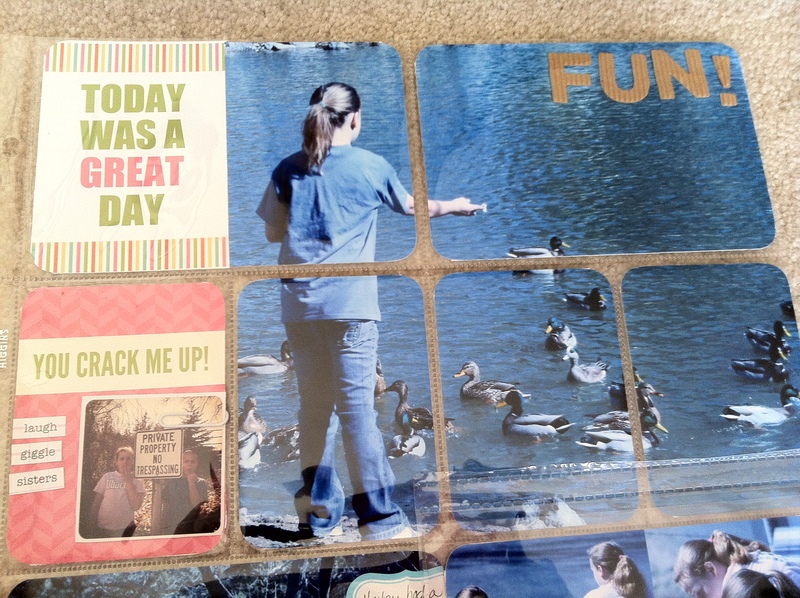 The photo enlargement (totally jealous of your weather that you can feed the ducks), the flip up page protector, and that long drawer for your journaling cards. Oh swoon!!! Can I add ‘go antique shopping with Jenny + Julie’ to my life list? 🙂 Great week – love it! Thanks Nicole! The funny thing is that we woke up to snow this morning. Crazy weather here. And if you are ever in our area we can totally go antique shopping. It’s a date! do that?!) Fabulous little bits of life included too. Love it all – thanks so much for the inspiration! Thank you so much! I just enlarged my photo & then cut it down to fit the slots. I got the idea from someone else. Thanks so much for stopping by! Really love the big picture over more pockets. Maybe some day..I am gonna try that too. Even though you kept it quit simple.. love what you did. Why goodbye to the Mc. D. wanna loose weight ? Me too.. so I am saying fast food goodbye for a while alos. Thanks Mariska! I loved playing w/the enlarged photo. We are saying goodbye to all fast food as it is just super unhealthy, we are spending way too much money eating out, & we want to be better examples for our girls. I do also want to lose weight & I know that will be a great thing about giving up the junk food as well. Love that large photo broken down into the different pockets. Well done! Thank you Melissa! It was really fun to work with & I look forward to doing it again in the future! Thanks for stopping by! Bread in general is a weakness of mine. This week I just kind of had an awakening about my issues with food & not wanting to pass those on to my girls. It is time for me to get my act together! So cool! I love the way that large photo looks on the right page. Way to think outside of the box! Thanks Sarah! I had seen the enlarged photo done similarly & wanted to give it a shot. Thanks for commenting! Thanks Heather! I would love to learn more about digital. I love being able to add all my tidbits and being able to flip through my album. I am planning on making digital year in review books for the grandparents for Christmas. Thanks so much for stopping by! Love the pic split over the pockets! Going to have to try that sometime! I understand about the fast food…chick-fil-a is my obsession–I could drink a gallon of their lemonade! good luch with your new goals! I LOVE the catalog drawer you found! How easy it will be to get a PL card when you need one! Have a great week! Thanks Jenn! I knew I had to have that drawer & exactly what I was going to do with it the moment I saw it. We like Chik-fil-A too, but we no longer have one in town which is good b/c I LOVED their sweet tea. Thanks for stopping by & your continued support & encouragement. OK, I NEED that journaling card holder!!! How fun!! I also love all the fun things you tried this week, especially the big photo spread over the pockets. Thanks Lisa! 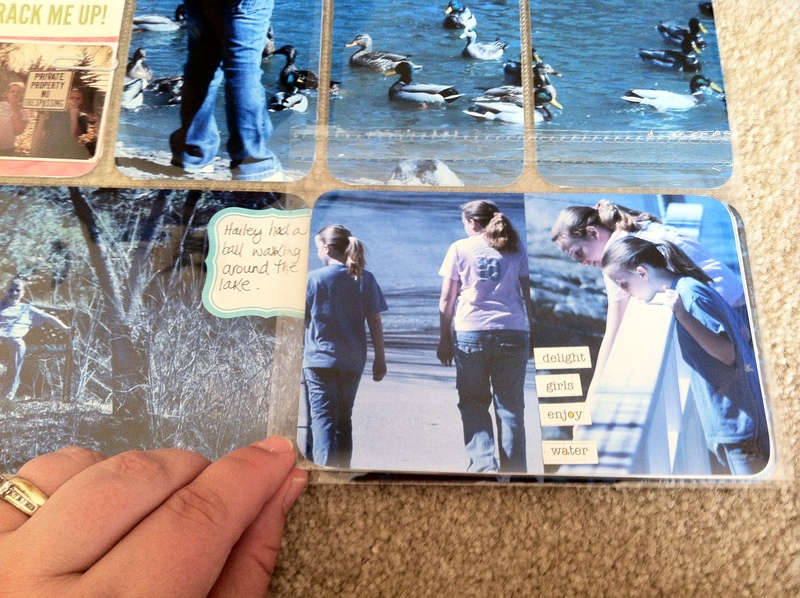 I loved using the enlarged photo spread across the pockets. I will definitely be doing that again. Thanks for stopping by! Wow, that drawer is AWESOME! Love the soft colors in those journal cards, too. I need to get some of those flip page protectors…such a good idea! Thanks Wendy! I love the flip up protectors too…it’s the perfect way to add a couple more photos without adding a lot of bulk. Thanks for stopping by! I love love your new card holder, need to get me one!! WOW WOW your enlarged photo came out so great when you cut it up like this. Great job on the idea and for doing it. Will try to do this in the future also. Love the Martha labels, how easy and perfect for the photos. Good luck with no more fast food, I am with you there. We rarely eat it and when/if I do it means my stomach will be hurting later. I love that you put that in here to remember. Thanks for the links and for sharing your wonderful week. Thanks Dawn! I know that we HAVE to cut out the fast food & just junk food in general. It makes me feel horrible! Thanks Conni! I love those digital cards. You will NOT be disappointed! Thanks for stopping by! Love your design F page, and your extra cards you got. Also love all your cards in the old library drawer. I worked at a libray in HS and in college, so dealt with those a lot. Super fun! Thanks Jen! Oh how I would have loved to work in a library…all those books..sigh! i just always love your pages–love the instagrams and LOVE how you cut a big picture down to fit in the pages–so cool! could you tell me…how do you print instagrams? do you have to have photoshop? Thanks Susanne! I appreciate your kind comments! I print instagrams using photoshop elements. I think you can also print them using Picasso (which I believe is free). My recommendation would be to google “instagram printing”. 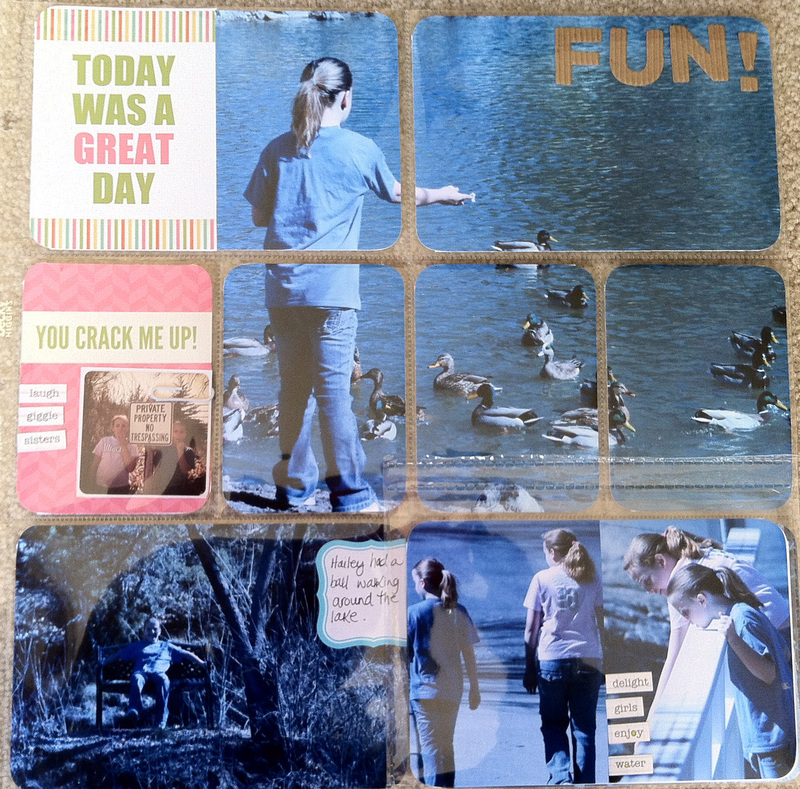 I know that both Deb Duty & Leena at http://www.findingnana.com both have had instagram tutorials with multiple ways to print. Check their blogs out! Thank you so much Kate! I’m so glad you loved that book…it is such a blessing! I always enjoy seeing your pages. Today I got through the 1st 42 blogs on the link up and then my eyes started to cross. 😉 Tomorrow I hope to make it through more. Thanks so much for your continual support & encouragement…I SO appreciate it! The big cut up photo is awesome! That looks so cool in PL format! I got Kristina & Crystal’s cards too, they’re fun! Loving all your square photos too. 😀 Great week! Thanks Sarah! Yes, I love those digital cards. Can’t wait to use more of them. I’m loving the square instagrams as well. Thanks for stopping by! This is seriously amazing ! How cool is that big photo youve cutted in a few pieces! LOVE! Thank you for the inspiration and the sweet comments you always leave on my blog! Definitely will hop on over every week to yours and be on the watchout for your new pages! Thank you so much Jasmin! I love your PL pages & look forward to seeing them each week. I really enjoyed using the enlarged photo this week & look forward to doing that again. Thanks for stopping by! LOve the big photo cut up, I am going to have to try that. LOVE, love the card catalog drawer! Thanks so much Liz. I loved working with an enlarged photo this week. It was fun to change it up a bit. Thank you! I LOVE those MS labels. I use them almost every week. The big photo was fun to work with, I’ll definitely be doing that again! Thanks for stopping by! Love the pages, love the giant photo. I need to try that! And the drawer! So jealous! What a great find! Thanks Deb! I LOVE my library drawer…it was truly a great find! LOVE your pages, Julie! You used our cards fabulously! Thank you for purchasing them! Love that wooden box, too! I want one! 😉 Ha! Thanks for linking up! Thanks Kristina! I absolutely LOVE your digital cards. I can’t wait to use more of them! Thanks for the link-up & thanks for stopping by! Love the split pic! Fun! Thanks Catherine! I look forward to doing more enlarged, split photos. Hi Julie – great pages! I’m digging how you split up that huge photo and split it between all the pockets. Now I’m wondering how that would look (or work) in my digi pages. And Design F is SO fun – so many chances for fun bits and pieces. Have a great week! Thanks Maria! I really enjoyed working with the enlarged photo & I totally love design F (it’s my new favorite). Thanks so much for stopping by! Thank you so much Jackie. These were some of my favorite pages so far! I hope you find your storage drawer in your shed. I’d love to see what you do with it if you find it! Nice pages! I got some pics developed today and had one enlarged so I can do the same! Saw that idea somewhere…can’t remember which blog…thought that was a great idea! 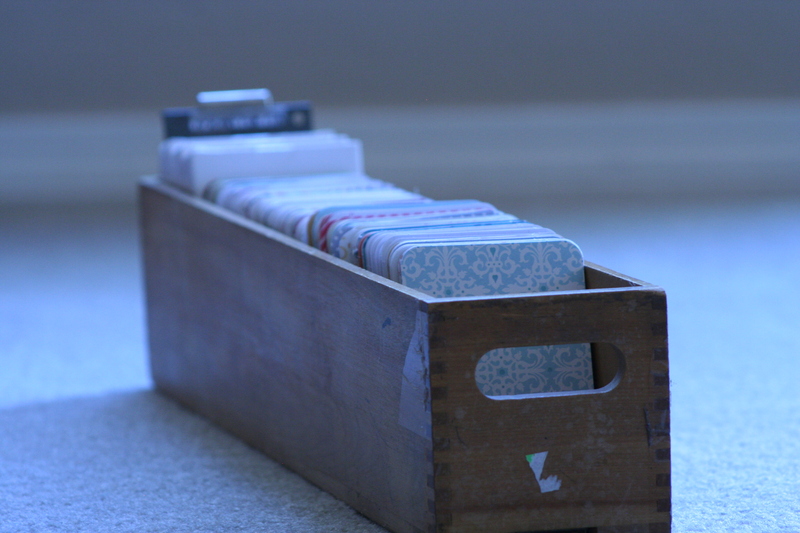 Also love that box you are storing your cards in. My husband likes to check out antiques…me, not as much, but now I will have my eyes open for something like that!!!! Thanks Juli! I’d love to see what you do with your enlarged photo! Leave me a link! Thanks for stopping by!